Do you want a toilet that will give you a commercial grade design, yet give you a lot of options still for your residential bathroom? Are you looking for a toilet that will help you save water, yet still get the job done? The Kohler Santa Rosa offers modern technology that meets or exceeds current government standards on water conservation, but does it with a design that is incredibly easy to maintain and clean. It’s a one piece design that offers a lot of functionality and you can save up to 25% off the MSRP just by shopping on Amazon! Coming in five distinct finishes, the primary feature that we really loved with this version of the Kohler Santa Rosa is the Class Five flushing technology that is included with its design. It’s a mass breaker-upper that will help dispose of some of the toughest amounts of waste that can be left in a toilet in just one flush. Although you’re not going to be able to flush a bucket of golf balls down it, you can flush pretty much anything you can leave as a deposit! 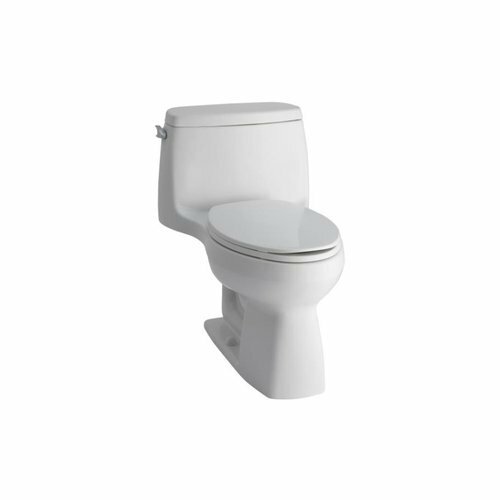 this toilet works on all standard installation points, incorporating a 12 inch rough-in. In some ways, a lot of the things you’ll see in this toilet appear to be a bit average when you take a first look at it. First impressions can sometimes be deceiving, however, and they definitely are with the Santa Rosa. It offers a strong, consistent performance and that’s something you absolutely need from a toilet! Is There an Advantage To Owning the Kohler Santa Rosa? The primary advantage that you’ll receive is surprisingly in the design of the trip lever. It takes very little effort to activate the flushing mechanism and that means this is the perfect toilet for the little ones who are just starting to train. One finger of adult force will be more than enough to activate the flush and then, because the seal is 90% less exposed in this model than in other toilets, you’ve got some extra long-term durability as well. Overall there is really nothing bad to say about this toilet. It has a fair, competitive price point and in return, you’ll get a high quality toilet. It doesn’t get more basic than that! Click here to compare prices on Amazon and get the best price on the Kohler Santa Rosa Comfort Height Compact.